APRNEWS - Russian President Vladimir Putin is travelling to Crimea on Monday to mark the fifth anniversary of Moscow's annexation of the Black Sea peninsula from Ukraine, condemned by the West but celebrated by most Russians. Putin will take part in celebrations in the contested territory, where he is also due to launch a new power station, the Kremlin said. 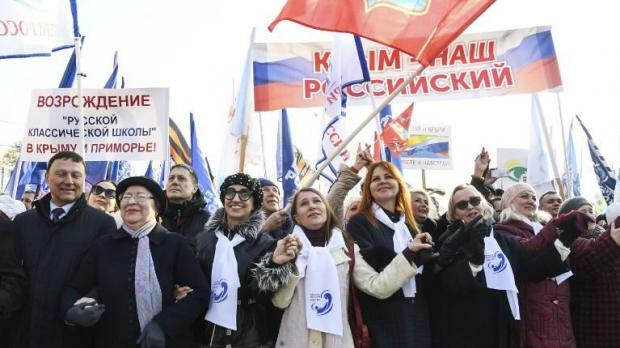 Moscow's 2014 takeover of Crimea was denounced by Kiev and the West as an annexation and led to sanctions against Russia, but it resulted in a major boost of Putin's popularity at the time. In Russia, March 18 has been officially proclaimed as the "Day of Crimea's Reunification with Russia". In Moscow, city authorities have thrown a street festival called "Crimean Spring" that hosts jazz concerts, cooking workshops and a photography exhibition a stone's throw from the Kremlin. Up to 10,000 people are expected to take part in a flash mob in the Moscow region Monday, dancing to the Soviet-era song "Waltz of Sevastopol" -- the Crimean city home to Russia's Black Sea fleet. "This is because its reunification with Russia was the result of the free will of the peninsula's people in a referendum," she added. Putin signed a treaty with representatives from Crimea to make it part of Russia two days after the unrecognised vote, on March 18, 2014. "What, have you gone mad?" he told a journalist who asked him if there were any circumstances under which he would be ready to give up Crimea in a documentary aired last year. "There are no such circumstances and never will be." "All these five years there has been an atmosphere of both open and hidden terror against the people of Crimea and international law," Ukrainian Foreign Minister Pavlo Klimkin told AFP. Ukraine "feels pain for this every day" and that "the international community will never recognise" the annexation, he said. But surveys show Russians are less enthusiastic about Crimea being under Moscow's rule than they were five years ago.